Make Your Mail Art Certifiably Official! This is a must have rubber stamp for every mail artist! Precisely laser engraved in the highest quality red rubber to give you years of trouble-free, crisp impressions. Plus, you can have anything you want (that fits at least), in the center of the stamp! Making your mail art or other rubber stamping project even more special. And, it's available in 2 sizes. 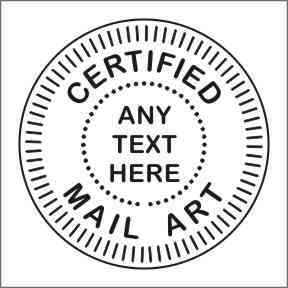 Like all of our rubber stamps, this Certified Mail Art Seal rubber stamp will be closely trimmed, including the cushion. Rubber die is mounted on our round stamp mount for ease of use. Easy to order! Just tell us what you want your rubber stamp to say by including your instructions in the comments section below. Custom made rubber stamps usually ship within 48 hours! Size: Lg. 1.25" O.D. (+$7.00)Med. 1.0 O.D.